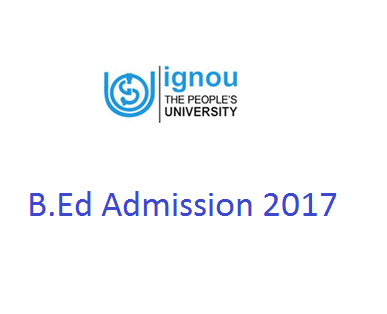 IGNOU - B.Ed Admission 2017 - What is the Eligibility? How to Apply? Last Date to Apply? Indira Gandhi National Open University invites applications for B.Ed (Bachelor of Education) Admission for academic session 2017-18. If you are interested to do B.Ed in IGNOU then you can get all details regarding B.Ed admission at here. How to Get Admission in B.Ed? What is Eligibility for B.Ed Admission in IGNOU? Please see below eligibility details for getting admission in B.Ed. (ii) Candidates who have completed a NCTE recognized teacher educations programme through face-to-face mode. The reservation and relaxation of 5% marks in minimum eligibility will be provided to SC/ST/OBC (Non-creamy layer)/PWD candidates as per the rules of the Central Government. The Reservation to Kashmiri Migrants and War-widow candidates will be provided as per University Rules. What is Duration of B.Ed? Last date to apply: 9th September, 2016. Medium of Instruction in Hindi or English? Yes, you have both options. How to Get Student Handbook & Prospectus? 'Student Handbook & Prospectus for B.Ed. – 2017 can be obtained from the Director (SSC), IGNOU, Maidan Garhi, New Delhi- 110068 or from any Regional Centre of IGNOU by sending a sum of Rs. 1050/- through a Demand Draft/IPO in favour of IGNOU payable at New Delhi/city of Regional Centre concerned or by paying Rs. 1000/- in cash at the respective sales counters. Please write your name and address on the back of the DD/IPO. Last date for receipt of request for 'PROSPECTUS' by post is 30th August, 2016. Can I Download Application Form Online? Prospectus will be sent to such applicants after receipt of Rs. 1050/ as written above. How to Get IGNOU Prospectus 2017 of B.Ed Online? You can download prospects of B.Ed at here by clicking the link. Good Luck for your B.Ed Admission and Entrance Test.